I've wanted to own a leg chain since I saw Vanessa Hudgens (LOVE her!) wear one a the Coachella 2012. It's actually sad that I've only gotten around to making one now, but here it is. The supplies you will need are pretty straight forward, and you can find most of these stuff at a Michael's or any craft store. Chain- I actually used 2 necklaces so their was a variety of chain textures. Elastic- You can find this at any fabric or craft store. You can also use an existing garter. Jump Rings- The sizes depend on the size of the chain you use. Pliers- the smaller the better, these will help with securing the jumper rings and chain. 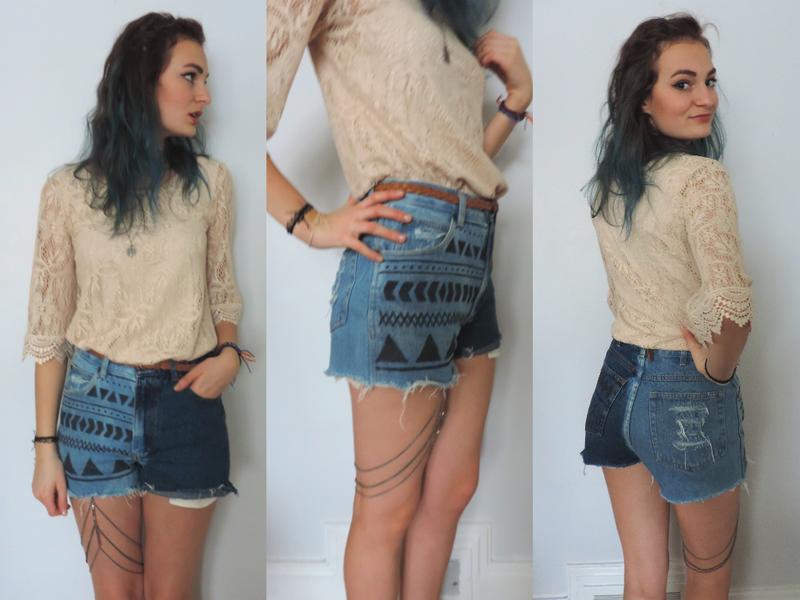 Shorts/ Skirt- Chose the ones you will most likely wear with the chain. STEP ONE: pick your faviorte short and put them on. It's better to pick your shortest pair so that you can measure the elastic at the highest point of your thigh where it will still be hidden under the shorts. STEP TWO: Measure the elastic at your thighs highest point to ensure that the shorts conceal it well. Leave about an inch of elastic over lapping itself so its easier to sew together. Pin it together and cut off the excess elastic. Sew it together either by hand or using a sewing machine. I find the best way to sew it is in a square; sewing along the top, bottom and the two edges, this helps keep it together when the elastic stretches. STEP THREE: Attach a safety pin to the elastic, this will connect the chain to the elastic. As an alternative you could punch a small hole in your elastic and thread a jump ring instead of a of using the safety pin. STEP FOUR: Using one of the larger jump rings, attach that to the end of the safety pin and the end of your main/middle chain. 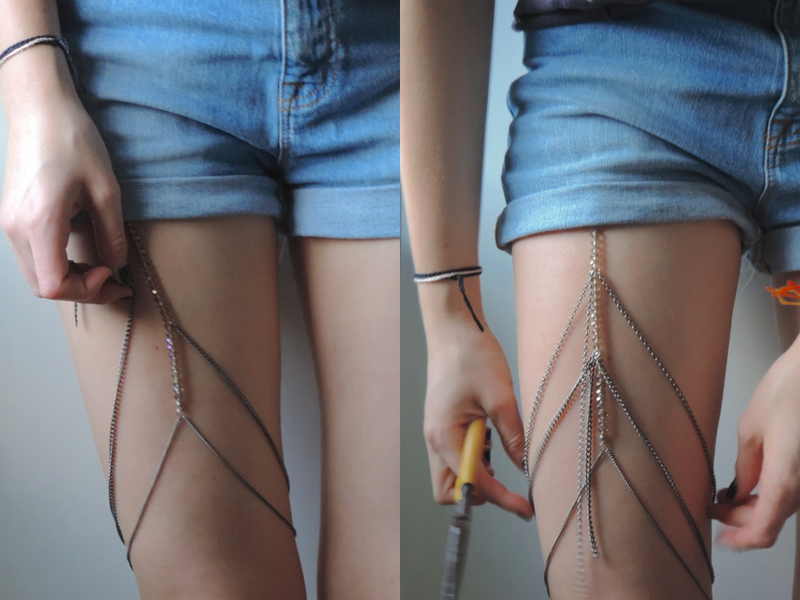 This chain should reach from the top to the middle of your thigh, so that there is enough space above your knee for the end chains to wrap around. My middle chain was about 5 1/2". STEP FIVE: Attach the first chain to the end of the middle piece using a jump ring. Wrap it around your leg keeping it loose fitting so that you can move in it comfortably. My bottom chain measured 19". When your happy with your length cut the chain and attach it to the same jumping at the end of the middle piece. You want to repeat these steps for all the other chains. You can add as may chains as you'd like. I chose to only do three. As you move up your leg the length of the chain for each section gets longer. My second chain from the bottom measured at 22" and the top chain was 24". The width I left between each chain was about 2". Hope you enjoyed and have fun crafting!! I put this together in a hurry last weekend when I went out to do some shopping with my sister. I recently bought both the hat and the sandals during an Urban Outfitters sale and I cant stop wearing them. I even wore the sandals in the rain (which was a horrible idea) but thats how much I love them. I got the blazer during my sisters garage sale, one of her friends let my buy it at a discount (3$) so why not. I wasn't sure how I was going to style it but I think this pairing work out well, especially with this cute cat crop top!! High-waisted shorts and crop tops are going to be all that I wear this summer so it's good to have variations of both to keep outfits interesting.